One of the oldest states in the Union (admission: 1788) helped establish the maritime and financial services industries in our country…and is the birthplace of the PEZ dispenser, the helicopter, color TV and America's first phone book (back when those were a thing). The oldest newspaper in the country, The Hartford Courant, first rolled off the presses in 1764 and is still around. 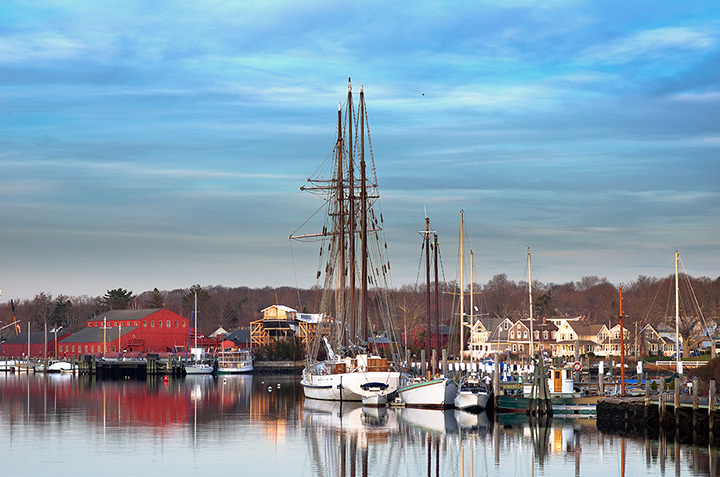 Yup, Connecticut is a cool mix of the old, the new and the enduring - and if you want to get the full flavor of the state, here are 20 things you must check out. The melting winter snows make the waterfalls of this park pretty fantastic. It's a lovely place to explore, with easy hiking, a covered bridge and a nice spot in front of the falls that just cries out for a picnic. It sounds like the name of a posh English estate - and, like an estate, its 250 acres of glorious ornamental gardens are done in a variety of styles. There are also woodlands, a museum, an aviary - and at the highest point of the park, a fantastic view of Hartford. A great place to take pictures, ride a bike or just drink in the springtime beauty. A rainy spring day is a perfect time to explore this fantastic complex, owned by and dedicated to the area tribe. There are interactive programs, art, a recreation of a 16th century village, dioramas and much more. Nicknamed "The Pink House," this National Historic Landmark recalls a more genteel time when the well-heeled (including several American presidents) enjoyed its charm and hospitality. There are lovely gardens on the grounds - and a barn with an indoor bowling alley! It's considered one of the most important bird areas in the country, with over 200 species having been spotted over the years. Hiking trails are spread out over its 600-plus acres and 12 sanctuaries. Naturally, there are some fantastic nature programs offered as well. This recreation of a historic seaport village provides a taste of the gritty life of seafaring types in the 19th century. There are many prominent ships on display (including an antique whaling ship), plus recreated buildings and a demonstration of skills like barrel making and fish processing as it was done back in the day. William Gillette was a stage actor, famous for his portrayal of "Sherlock Holmes." This historic stone castle, built in 1919, features many quirky details, right up Holmes' alley: hidden doors, spy mirrors, strange doorknobs and more. You know you had at least one PEZ dispenser as a kid. This fun museum, located at the factory where the tiny treats are made, showcases the history of the candy, going back to 1927. There's a ton of memorabilia, including a motorcycle that is the biggest PEZ dispenser in the world. Amusement parks and summer just naturally go together - and this is thought to be the oldest one still in operation in the country. There are tons of fun rides, and for the history buffs, a wooden roller coaster from 1927 and a carousel from 1911. Splash in the waters of Long Island Sound and enjoy one of the favorite boardwalks in the state. The shoreline is especially lovely for a sunset stroll. The definitive American writer spent several years living and working here, and considered the time the happiest period for he and his family. There are many informative exhibits, including audio versions of his writings. And for easily bored kids, they offer a scavenger hunt with prizes! Explore everything from vintage World War II planes (including a fantastic B-29 bomber), to a variety of helicopters and many more aviation wonders - including some that are pretty rare. Many exhibits allow you to climb inside, too. What a beautiful place for a fall hike. There are a variety of trails, suitable for all levels. Hike to the observation tower for some panoramic views of the Silver City and beyond. Get up close (sort of) to nature at this 4,000-acre preserve. Once you're done exploring the outdoors on their trails, head inside to their cool nature museum. There you can learn more about the animals who live on the preserve - even explore the art of taxidermy. For kids, there's a special room with a home for snakes, a beaver dam and more fun features. Some of the state's earliest residents (entombed from 1687 to 1812) are at rest here in this crypt. Among them, Benedict Arnold's first wife and a founder of Yale. Get in the Halloween spirit, and enjoy some history, too. Take a ride on the historic, picturesque Naugatuck Railroad - or just poke around their great collection of steam locomotives, cabooses, freight cars and more. At the holidays, they do a fun "Polar Express" run for children. Founded in 1832, it's the oldest college art museum in America. Explore over 185,000 objects that date from ancient times up to a more modern era. Not a bad way to spend an afternoon. Who knew that the Nutmeg State is also home to many world-renowned chocolate artisans? If you've got a thing for the cocoa bean (and who doesn't), you'll want to explore some of them. Dinosaurs! There are so many great fossils, an awesome mural and pretty much anything you'd want to send you back to the "Jurassic Park" era without getting chased by raptors. Who could resist a place that features "Stingray Bay"? That's just one of the many attractions, including a jellyfish gallery, a shark "touch pool" and more. They also offer a sea lion show, Beluga whales that swim right up to the glass wall of the tank, African penguins and so many more fascinating attractions.